Here they are based three-figures per 40mm squares. This is the basing for the modified version of Hail Caesar I've been using. 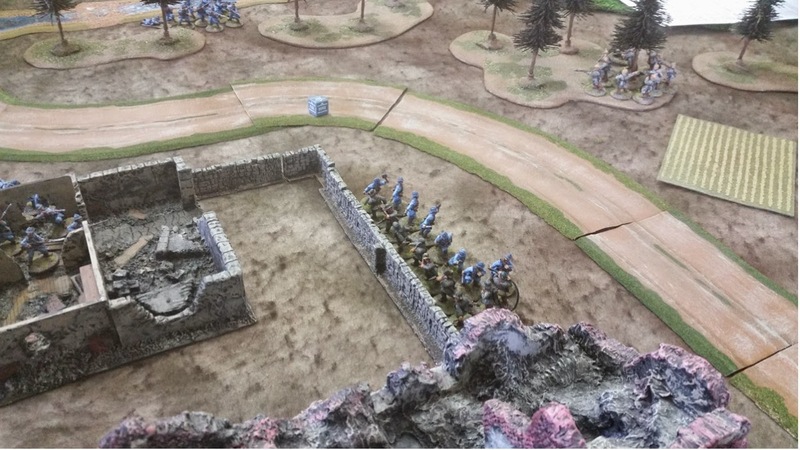 It not only stretches the number of units a bit, but allows for easier basing. And once the battle begins no one seems to notice, or care, about how many figures are on a base. And as far as these figures go, ranking them up for something like WAB would be pretty difficult thanks to their dynamic poses. I went ahead and re-based the Spanish Scutarii too. These were painted a couple of years ago - one of the first projects using the Minwax stain. Here they are - less their shields - with a fresh brushing of Minwax Tudor Satin stain. These guys painted up with no problem. Wish I picked up the other box that was for sale at the bring and buy last week. The mail took the staining well; I guess I was a bit too vigorous with the brushing as I broke one of the spears. The image below shows them block painted prior to the staining. I noticed only after applying the stain that I forgot to paint their wrist bands, as well as the bandage over the eye on some of them. I plan to paint the shield either a pale blue or green. Picked this box up at the bring and buy at last week's game day at Fort Steilacoom. Couldn't pass up on the price, and always wanted some Auxilia to complement the Legionaries. Anyway, here is the start of the 24 figures - which consist of four poses and some separate arms. The set doesn't come with a command, but does come with water-slide decals that go over shields painted in whatever color you chose. The shields are left off and remain on sprues for ease of painting. The heads, arms and spears are ready for production line assembly. 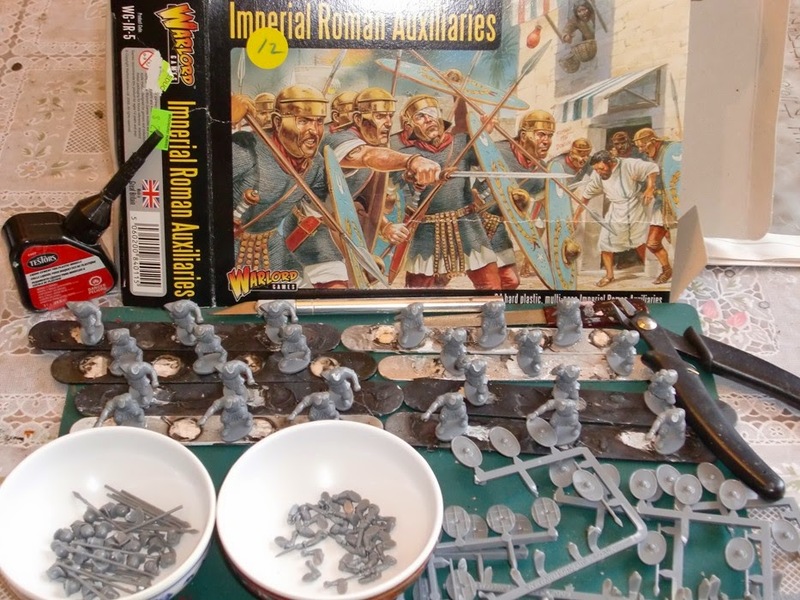 The figures will be part of a Battle of Las Rabas scenario set during the Cantabrian War of Augustus Caesar. Granted both contingents will have a slightly anachronistic look - Romans in lorica segmentata, and nekid Gauls and Spanish Scutarii doubling as Cantabrians. Many of you may have already seen this announced on various internet sites, including TMP. I found out this morning when visiting the Wargames, Soldiers and Strategies site where Guy Bowers posted an announcement. Although I never met Allen in person, I became acquainted with him about a decade ago when I first visited TMP. We communicated on that site, as well as off line too. We discovered that we had been assigned to the same Army installation at the same time way back when. This was in 1980 when I was going through Basic Training at Fort Knox, KY. He had been a company commander in a sister company at the very same time. He was friends with the CO of my company - and they had stayed in touch over the years too. I considered Allen a buddy too. Anyway, I just felt that Allen's contributions to the hobby should be recognized; even in a very small way here. He will be sorely missed. Okay, these aren't newly painted figures, but I just rebased them for use as a 1st Crusades Warband. They are on parade awaiting the arrival of their Warlord - just ordered from Black Tree Designs. 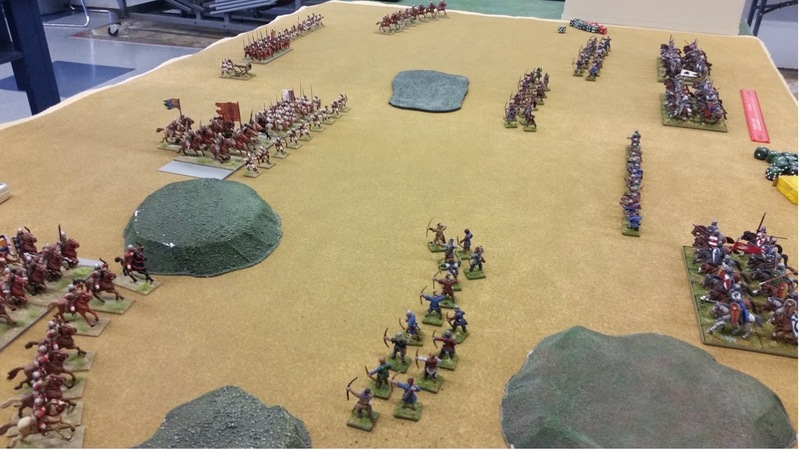 This 6 Point Warband consists of two Mounted units of Hearthguards, one each Warrior unit of Mounted, Crossbows and Bows; and finally a Mounted unit of Mercenary Warriors. All of the figures are from Crusader - appropriately enough - except for the the crossbowmen which are Old Glory. The shields have LBMS transfers. 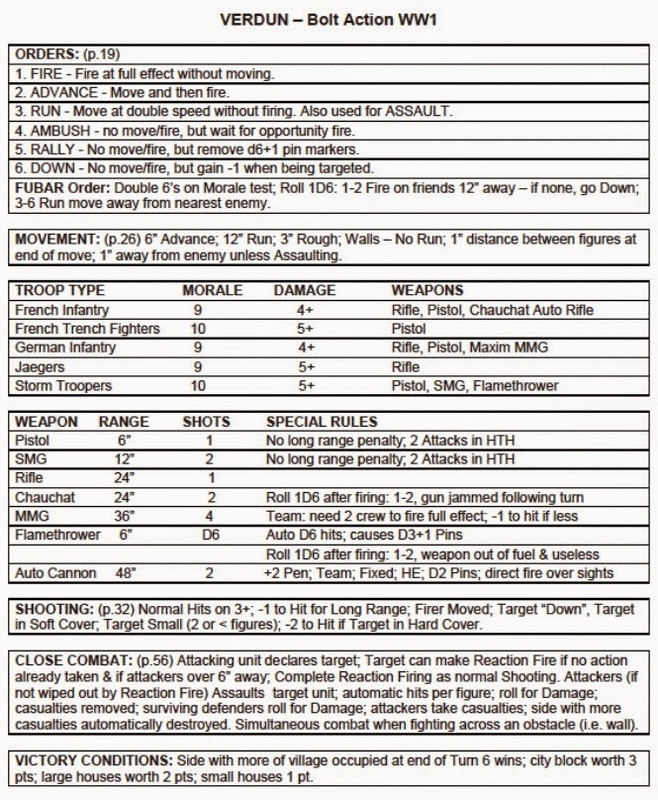 They were originally part of a WAB army, and used extensively in the past. It's nice to have them out of the barracks in anticipation of some SAGA battles. The last time I played SAGA was a couple of years ago - and had used an all foot Viking Warband. I recall being soundly defeated by a Norman Warband with troops similar to what this Crusader force is. Looking forward to seeing how these guys perform. 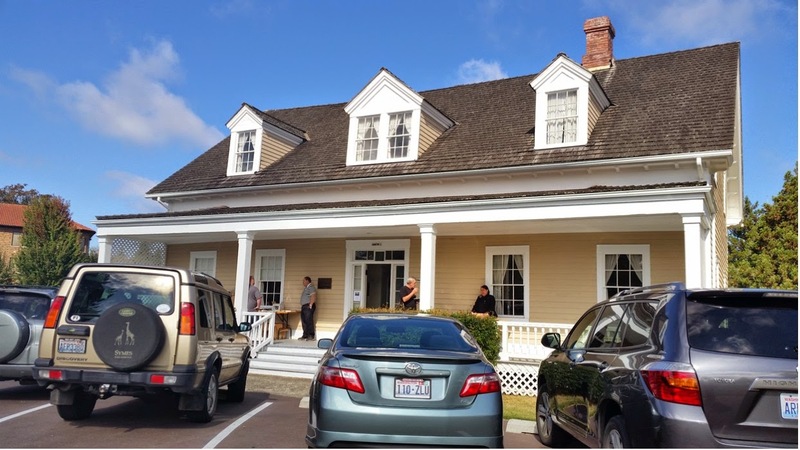 Attended the annual game day today at Historic Fort Steilacoom. One of the NHMGS members is on the preservation society at the fort so we get to use Quarters Number 2 for gaming. Quarters Number 2, Fort Steilacoom. The main room at the start of the first period. 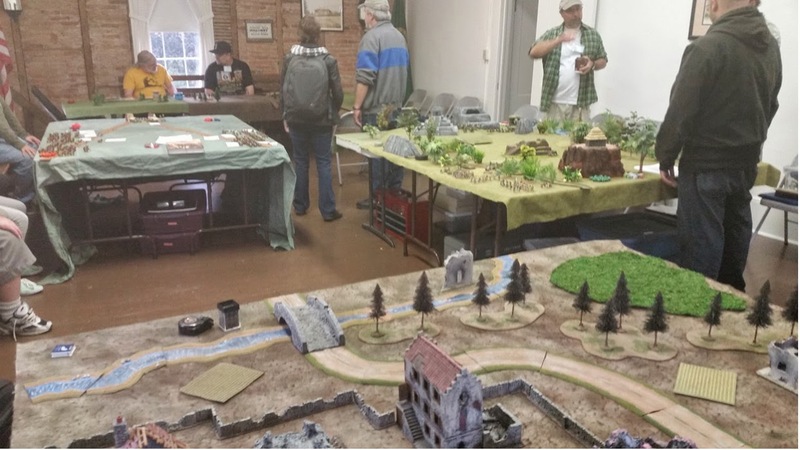 The WW1 Bolt Action game in the foreground. 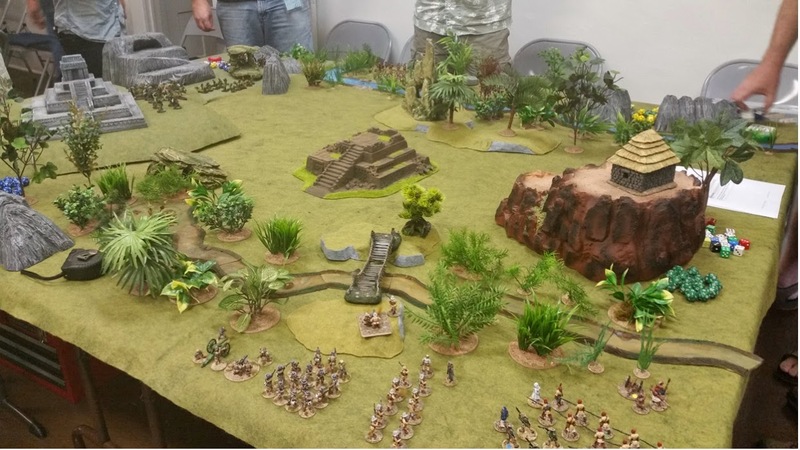 I ran a WW1 game using Bolt Action. 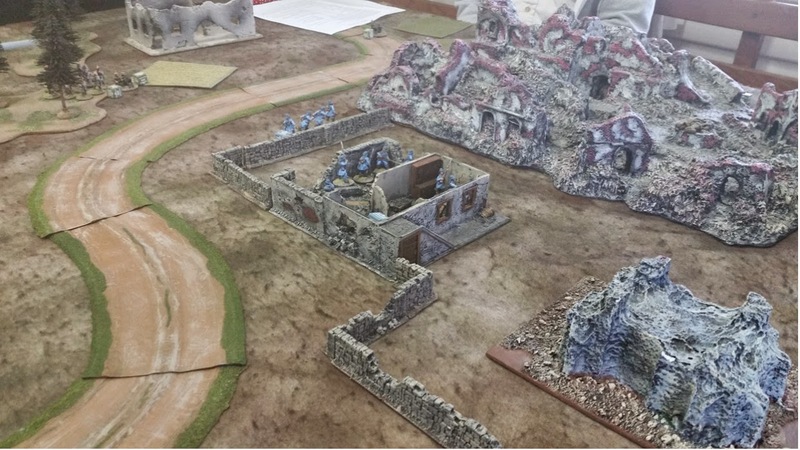 The scenario had both French and Germans advancing upon an abandoned village. 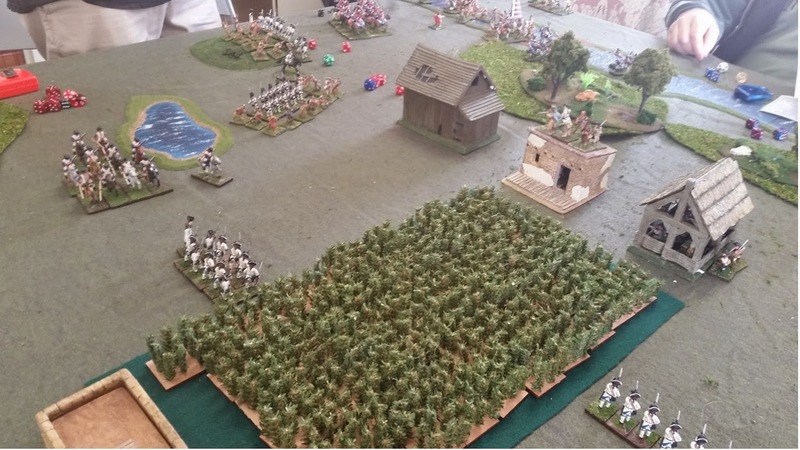 Whichever side occupied more of the village won - in today's game it was a French victory. Early on, German Storm Troopers take on French Trench Fighters in hand-to-hand. The Germans were eventually defeated - losing their best assault troops, including a flame thrower team. The Germans tried very had to retain their real estate; even trying out the newly invented A7V tank to no avail. 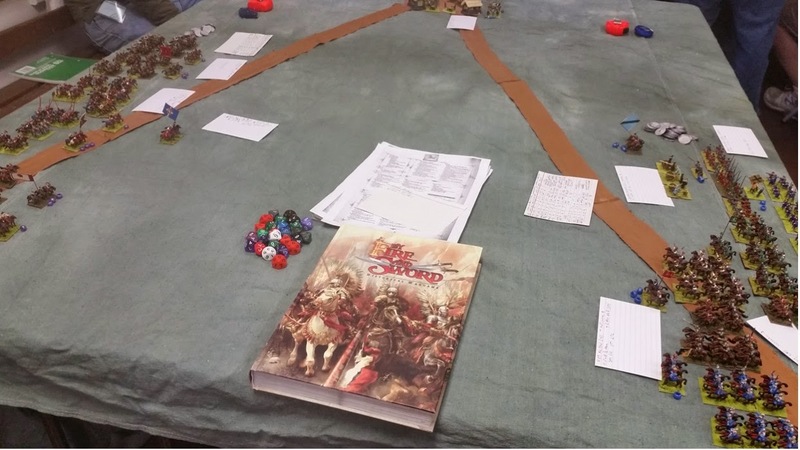 Regrettably, I failed to get a shot of a Napoleonics game using Garde du Corps being played in another room. I also had to leave after lunch and didn't get shots of the afternoon games. It was a nice gathering, and nice to see member of our group in such a nice setting. For the record, the players for my game all had a great time and want me to run it at our annual big convention next year. I had planned to do this, and their positive feedback confirms it. 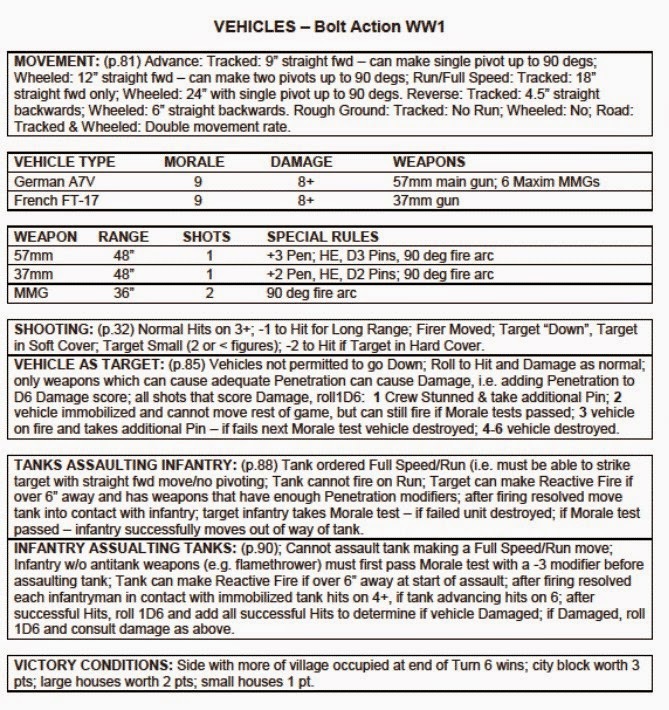 ADDENDUM: Below are copies of the QRS's for the Bolt Action WW1 Game. Note: the QRS has the game ending after Turn 6, but the game played so fast, we actually played about 12 turns. I changed the end of the game to a time limit, not an amount of turns. Something which will work better at the convention with blocked times (as this event also was). 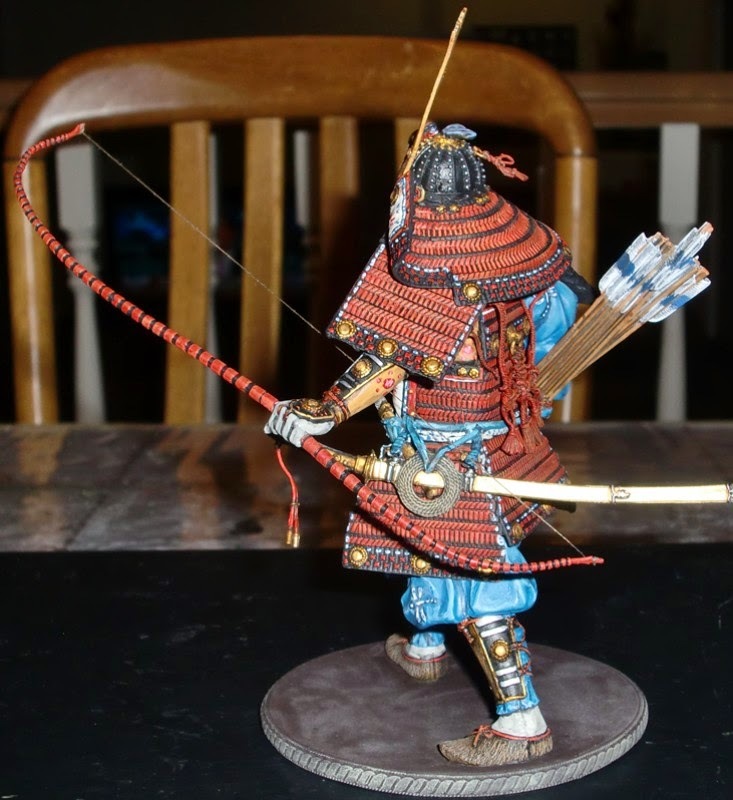 Here he is - with his strung bow, offset for riding on horseback. He's quite a heavy beast - almost afraid his weight may break the glass shelf of the display cabinet. Here he is with a 28mm T.A.G. 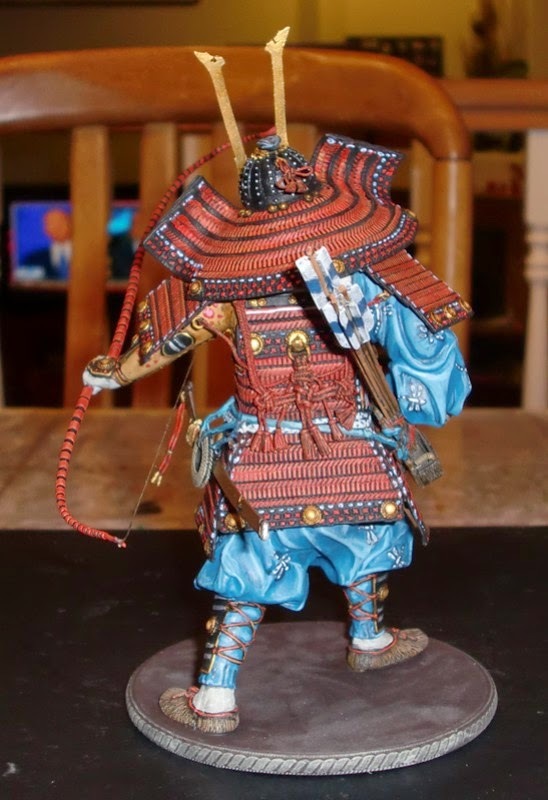 Samurai in similar armor. He was a nice change up from 28mm figures, but I'm ready to get back to them now - Bolt Action and Saga are on the menu for this Saturday at a game day. In the home stretch - only need to do the weapons - bow, quiver and sword/scabbard; oh, and the large knot for the back of the armor. I got lazy and failed to paint the inside of the shoulder armor. 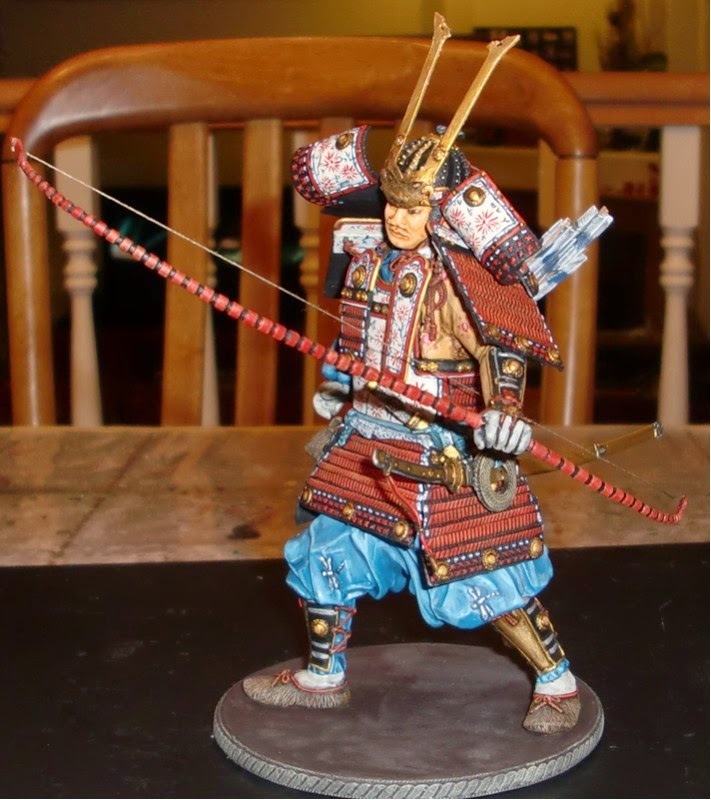 The dragon fly motif was a favorite for samurai as it was believed to never back up - that is, retreat. A large knot will go on the back of the cuirass. 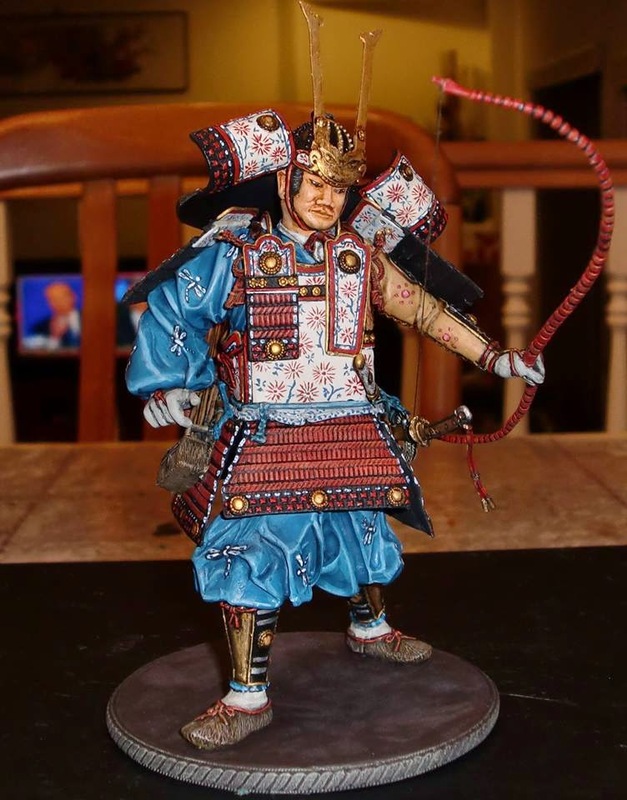 During the Heian period, kote - or sleeve armor, was usually only worn on the left, bow holding arm. 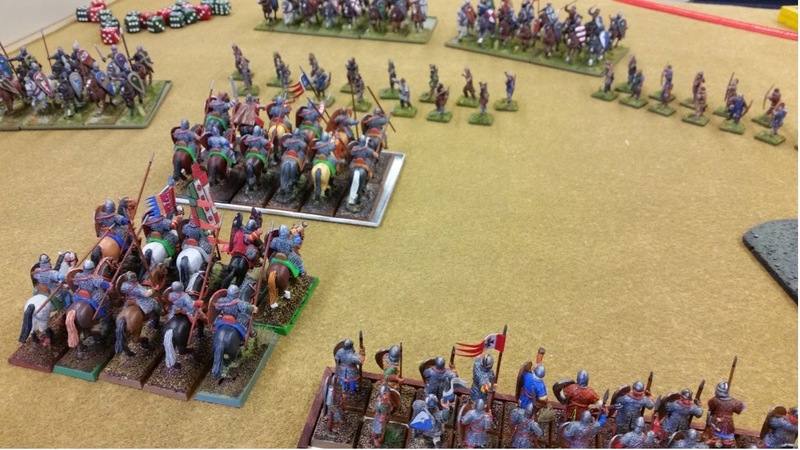 Not the biggest turn out for our monthly WAB Medieval Campaign Day at the Game Matrix, but we did have some good games - in fact, I won an overwhelming victory with my Early-HRE army over my buddy Adrian's feared English longbow-heavy army. The HRE knights' 2+ armor save coming in very handy in defeating two of Adrian's longbow units in HTH combat - even after taking heavy arrow fire. 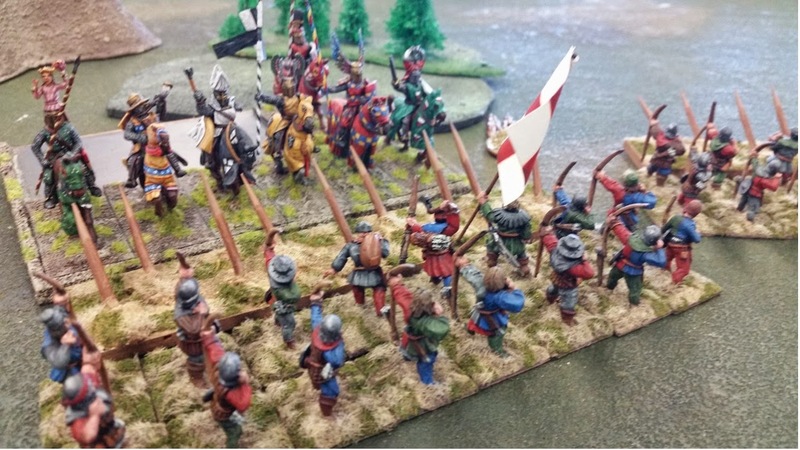 The remaining HRE knights about to take out a second English longbow unit in HTH - in spite of charging through stakes. Actually, the knights, including the Army General, failed all of their attacks, and it was the warhorses that caused the English casualties. The HRE left flank was well supported by allied Hungarian Szekeler Expert Cavalry. 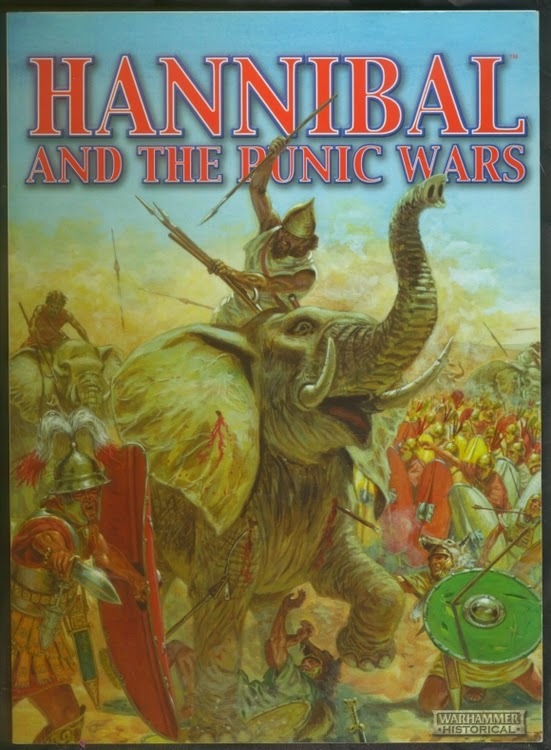 Their Parthian Shot capability never allowing the English Hobilars to even be a threat. The Szekeler cav rode up to the rough terrain, fired and moved back to safety for every one of the six turns. The Militia bowmen on the hill never did any damage to the English foot knights. Although the HRE light bolt thrower did very well - taking out six knights in two turns. 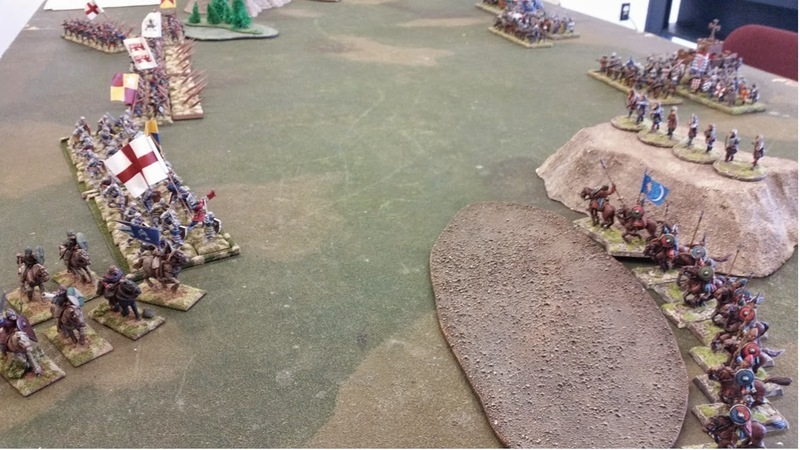 The picture below has Old Bob's Normans facing off against Ron's Normans - Ron won this game. 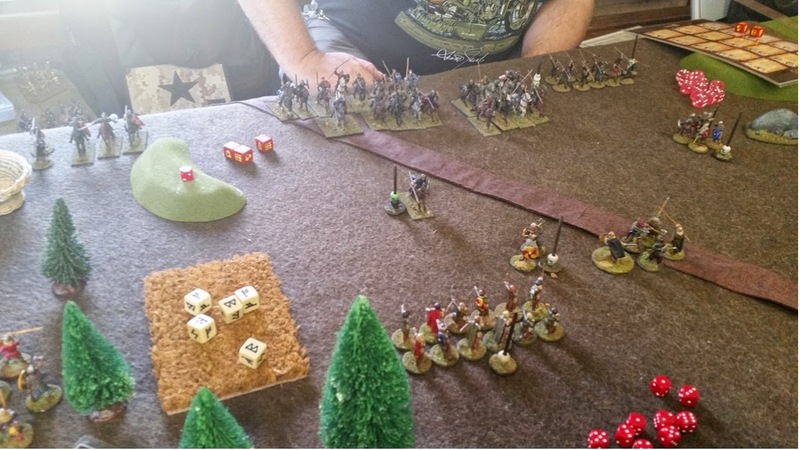 As Pat was the odd-numbered player, he went against Ron's Normans next. Ron won this second game too. 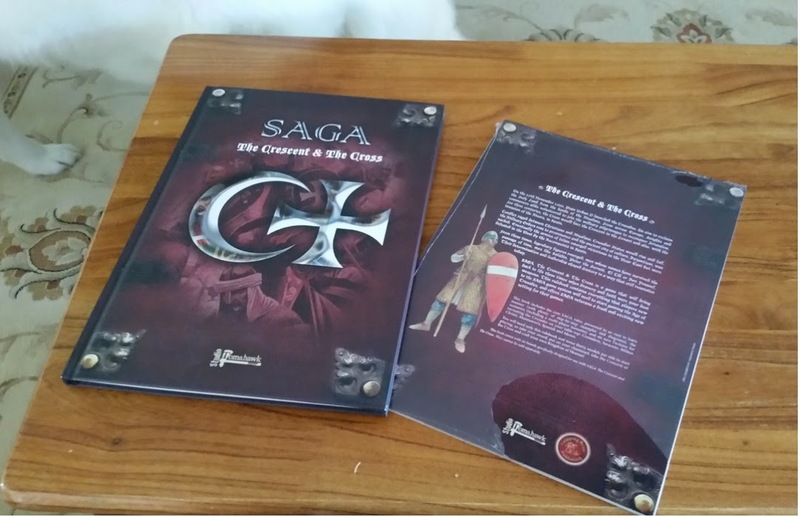 Finally, I picked up a copy of Saga's Crescent and the Cross from Pat - he in turn had picked it up at his recent trip to Germany to attend the WAB GT there. He got the book from the author Alex Buchel, who also attended the tournament venue. 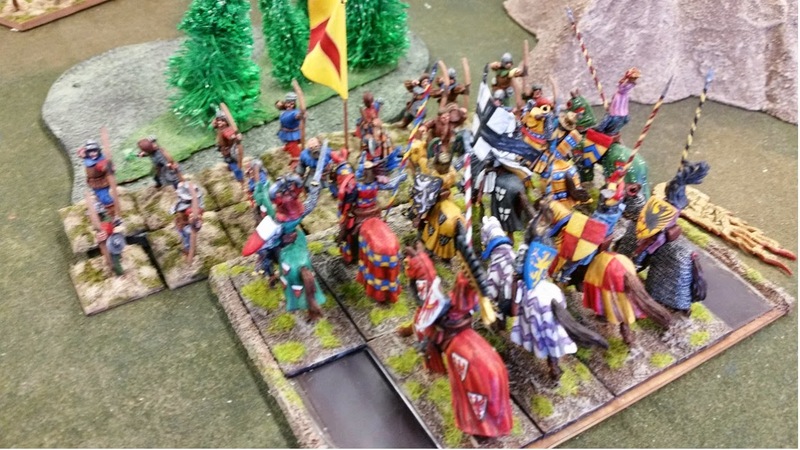 I hope to use my Normans as Crusaders at a Saga game day in November. Haven't played Saga since 2012, but looking forward to getting some games in soon. Spent some time finishing up most of the armor, as well as the face - the only exposed flesh area. The hands are wearing doe skin gloves. The two chest armor pieces, head and shoulder armor are not glued to the torso yet - and tacked on to see how the pieces fit - particularly the shoulder armor as the neck guard hangs very low from the helmet. Besides the clothing, the sword, bow and quiver still need to be painted. The agemaki, or large knot also needs to be added to the back of the cuirass. Won't get much painting done tomorrow as I'm meeting up with some of the local WAB crew for our Medieval Campaign. I'm using my Early-HRE army. Motivated by a post from local gaming buddy and former NHMGS President, Kevin Smyth, I picked up the brush for about an hour late in the night, and worked on the printed leather portions of the armor. Tried to copy the pattern from the box art and instructions, but it's more of a simplified interpretation of it. Kevin had mentioned on the NHMGS Facebook that even if you only paint for an hour a day (or night in my case), you'll be surprised at how much can get accomplished. I'll touch it up a bit after the Minwax staining process. Dry-brushed the basic lacing pattern; as well as the red lacquered knots. The Minwax stain process should clarify the lacing a bit more. I chose a solid red pattern for the lacing, as more elaborate types tend to take away the from the overall look of the armor. 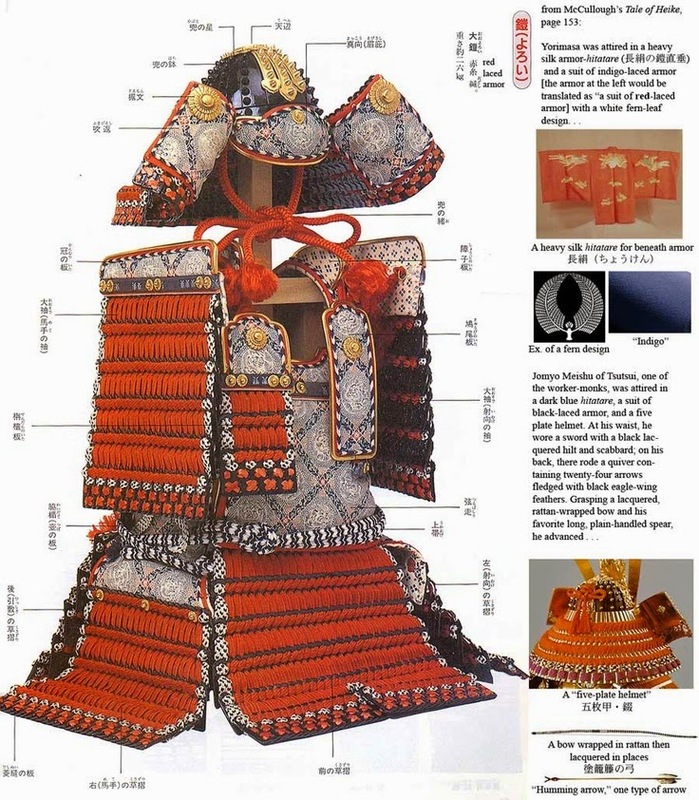 Here's a nice image of the construction of the O-yoroi - or great armor. Here's a very old metal model that I picked up off of ebay some years ago for about $30.00, IRRC. I see it going for a lot more now. Anyway, it's a huge and weighty piece of metal that measures about 135mm from soles of feet to top of the kabuto (not including the crest). The seller (or someone else) had epoxied the torso ad legs together - rather messily too I might add. I soaked the epoxied parts in DOT3 brake fluid for several weeks - basically because I forgot I had done it. By the time I check on it again (using latex gloves), the epoxy had loosened off and the parts were cleaned up. Here it is below with the main parts glued together with Loctite Super Glue. A Dremel was used to even out parts of the seams - as the casting didn't fit together as perfectly as current models. 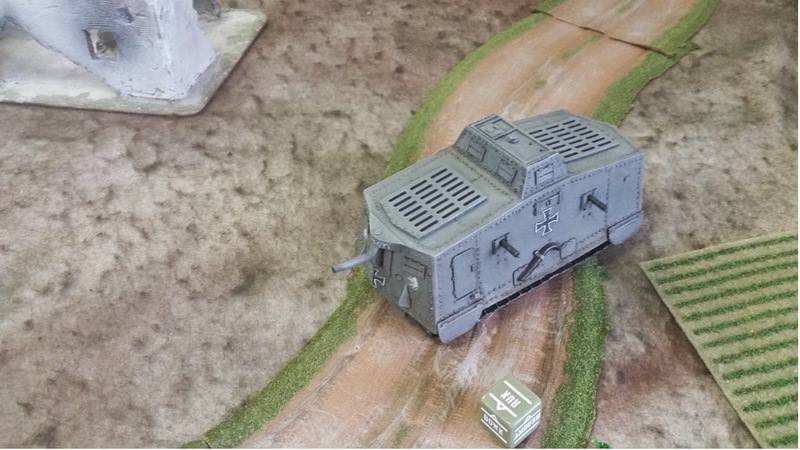 A 28mm T.A.G. 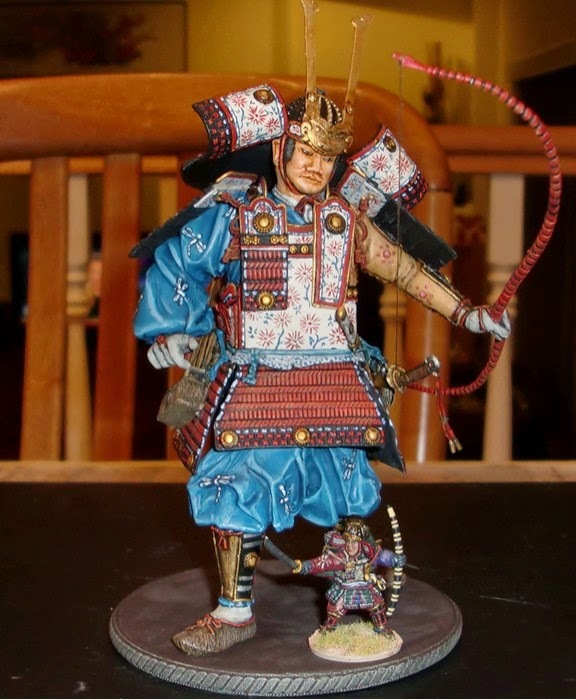 samurai sits on the base for size comparison. Here's the model with all the parts separated. The kit is from the 1970's, and incredibly all the parts were in pristine condition - as well as the box and full-color instruction sheet. I don't plan to spend as much time and effort on it as the one pictured on the box art. 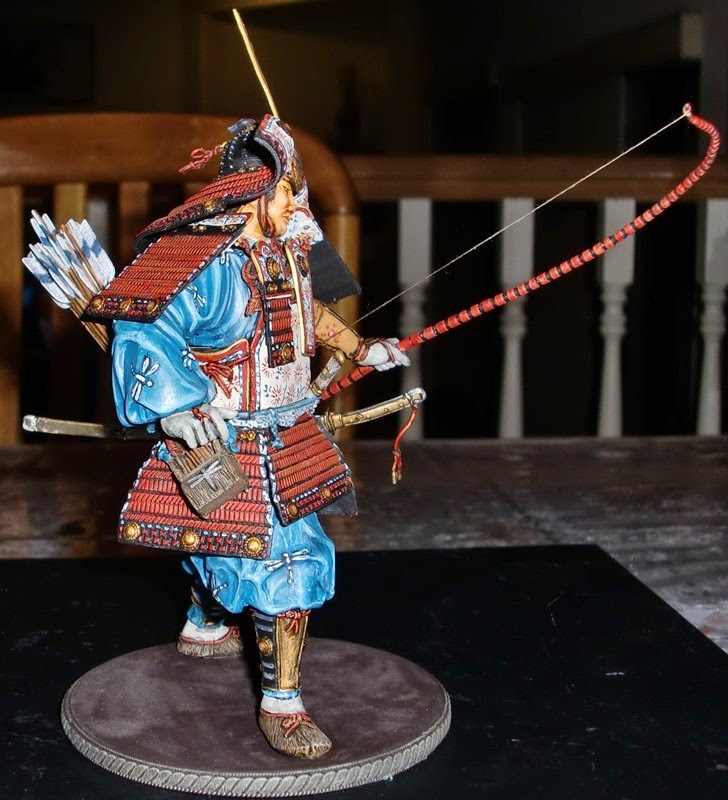 I will likely paint it up much the way I do 28mm figures now - that is, a basic paint job followed by Minwax staining. This is just one of the few remaining large scale models I have packed away that I want to get painted up.